On our visit to Volendam, the first thing we did was to stop at the Art Hotel Spaander for apple pie and coffee. We had just had breakfast in Amsterdam not too long ago and we certainly didn’t need more food at this time. But when we were brought through and seated in one of the dining rooms, it became clear that the apple pie and coffee was not the highlight of this stop. 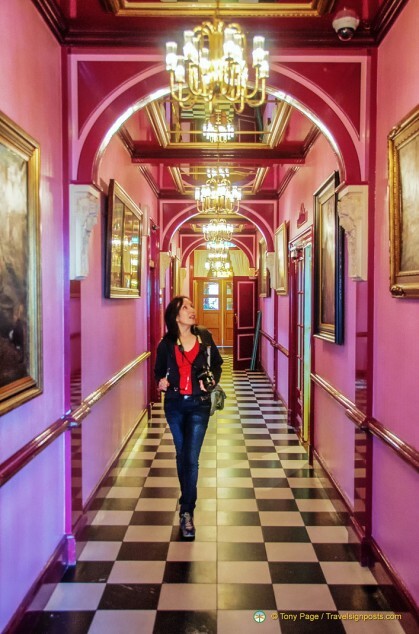 This charming hotel has a history and art collection that have made the Hotel Spaander one of the attractions in Volendam. The Hotel Spaander calls itself an “Art Hotel” because it really does have a large collection of artwork decorating every wall and room of the hotel premises. Last count, there were about 1,400 pieces of art. The hotel is named after its owner Leendert Spaander, who had a keen interest in art. When Leendert Spaander got married in 1876, he and his wife invited local Volendam artists to work from their home so as to create a social environment for the artists. Spaander was multi-lingual and through this language ability, he was able to make contact with foreign art academies and through them he invited foreign painters to visit Volendam. By 1881, their home had become too small, and that gave them the idea of acquiring larger premises on the dike. They built a new hotel and at the back of the hotel they provided space with which they created an artists’ colony. As gratitude for his hospitality or in lieu of payment for the hotel room, the often-poor artists would give Spaander pieces of artwork, all of which he displayed on the walls. It seemed that the Volendam scenery was not the only thing that charmed the artists as three of Leendert Spaander’s seven daughters were married to these visiting artists. But who could have blamed them as we were told that Volendam girls are very pretty. In addition to art, the public areas of the Spaander Hotel are decorated with all kinds of collectibles that are sure to send visitors tripping down memory lane. There’s an old cash register, a beer pump, grandfather clock, plates, bottles, etc. The Hotel Spaander’s guestbook is filled with names of famous movie stars, composers, writers, singers, heads of states, etc. Renoir was one of the visitors and I wonder if he too left a piece of art here. There were a few Renoir-like pieces of art in the hotel. It’s a shame that we didn’t get to do a guided tour of the hotel’s art collection as it would have been interesting to know a bit more about the artists that worked here, especially the one who felt inspired to paint the toilets. 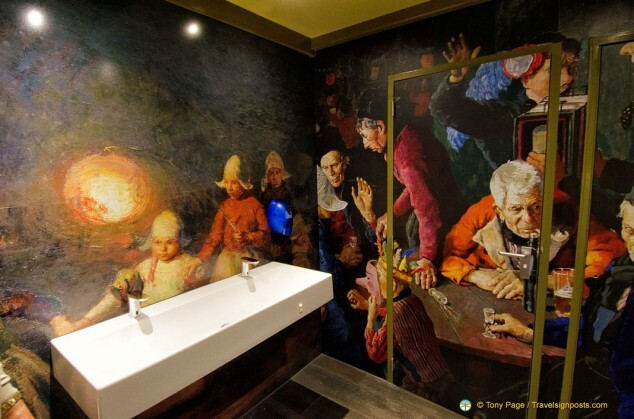 Tony was most amused when he visited the men’s toilet to find the room covered by art. So I went to check the ladies and it too was a piece of art. The Hotel Spaander is now a Best Western Hotel. 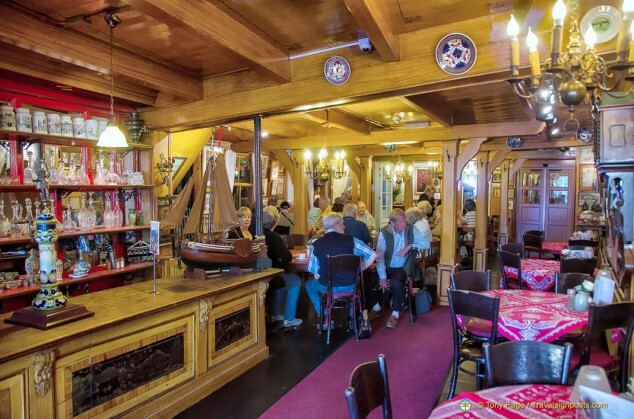 This charming hotel enjoys a central location on the banks of the IJsselmeer and it is close to the shops, restaurants and cafes. Although we didn’t stay in Volendam, I imagine that one of the rooms with a balcony and facing the lake would be very relaxing. 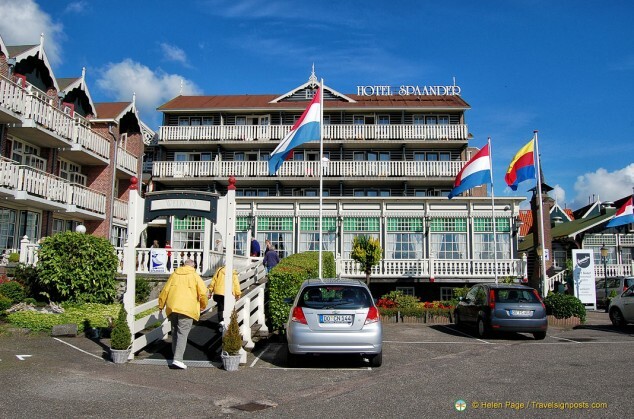 If you enjoy art, this is the Volendam hotel to stay at.